Surprisingly, over 75% of all dogs and cats have periodontal disease by the age of 3 years old. Early disease is usually not easily detectable without examining the mouth, but signs of more advanced dental disease are bad breath(halitosis), excessive salivation, painful chewing, and tooth loss. These problems are often identified during your pet’s yearly checkup. Young animals often do not require professional cleanings. However, older animals, and animals with a predisposition to bacteria accumulation in the mouth, require more frequent cleanings. Periodontal disease begins with bacteria combining with sugars from food to form plaque on the teeth. Next, minerals in the saliva attach to the plaque to form tartar, a harder substance that bonds to the teeth. The bacteria work their way under the gums and cause gingivitis — which is inflammation of the gums. This is when pain can start to develop in your pets mouth. Once under the gum line, bacteria destroy the ligaments around the tooth that attach the teeth to bone, leading to tooth loss. This condition is known as periodontal disease. The bacteria associated with periodontal disease can also gain access to the bloodstream to infect the heart, kidneys, and liver. A professional veterinary dental cleaning is the only way to remove formed tartar from the teeth and under the gumline to protect your pet’s oral health. With a professional dental cleaning and appropriate home care, gingivitis is usually reversible. Periodontal disease, however, is not reversible. Regular veterinary cleanings can significantly help to slow down the deterioration of ligament loss. Maintaining a consistent home dental care program can also help keep your pet’s mouth healthy and increase the times between dental cleanings. Dental radiographs (X-rays) to evaluate problems below the gum line. Inspection of the entire mouth for tumors, infections, trauma, etc. Regular inspection of your pet’s mouth is critical in catching dental disease early. Tartar may appear as a tan-colored covering on the teeth. Redness or bleeding along the gumline may indicate dental disease. If you notice any of these signs in your pet, schedule an appointment with us. What Can I Do Myself to Keep My Pet’s Teeth Clean? After a dental cleaning is performed, keep your pet’s teeth clean to increase the intervals needed between dental cleanings. We may recommend a plaque prevention product — a substance that you apply to your pet’s teeth and gums. The product adheres to the teeth surface to create a barrier that prevents plaque from forming. We have had significant success with regular use of Oravet chews. These are tasty daily treats that disperse a barrier called delmopinol in the mouth. This acts as a short-term sealant, keeping food particles from adhering, while the sticky substances help pull plaque off teeth. Also, just like us, daily tooth brushing can help remove food particles from your pet’s teeth. 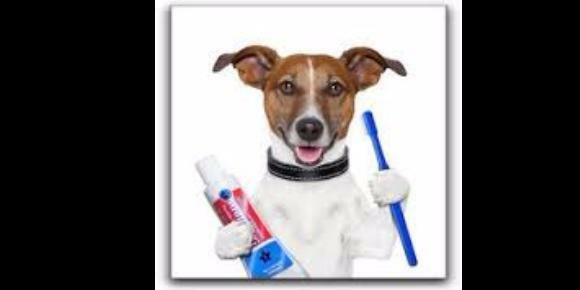 You can use a child’s toothbrush or purchase a pet-specific brush. Human toothpastes should not be used because they contain ingredients that should not be swallowed by pets. Your dog or cat may actually like the taste as well, as they are available in flavors such as chicken, seafood, and beef. Several dental diets and treats can also help to minimize plaque and tartar. The diets provide a more friction on the tooth surface when chewed, and compress instead of crumble when chewed to increase surface contact with the teeth.